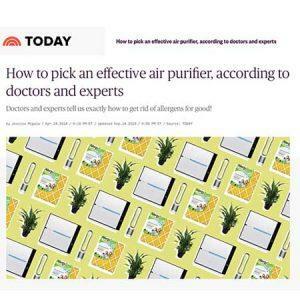 Great article in Today magazine by Jessica Migala listing the best air purifiers for the home according to doctors and experts. Among the six air purifiers short listed in the article, three of them passed our strict scientific standards and are certified by our asthma & allergy friendly® Certification Program. These are the Fellowes AeraMax 100 Air Purifier, the Rabbit Air MinusA2 Ultra Quiet HEPA Air Purifier and the Dyson Pure Cool Link Air Purifier. These air filters are explained to be the highest quality air filters that people with allergies can rely on to decrease their exposure to triggers.